North: Hold the context and provide ‘top cover’ for all those working within the enterprise. Sustain the steadiness of intent of the enterprise. East: Legitimise questioning in the name of what-the-client-wants, so that the enterprise never loses a sense of its ‘edge’. Allow the otherness of the client to lead you to what is needed in their situation. South: Ensure that the supporting resources and infrastructures are appropriately agile, so that it becomes practicable to take up the questioning and to do something effective in response. Know where you are and what is possible. West: Make it in people’s interests to engage both with the questioning and with finding ways of responding effectively, which is both a matter of the way individuals benefit from their work and also a matter of enabling them to be equipped with the appropriate skills, knowledge and experience to act effectively. Enable people to align whatever is available from the South to the demands from the East within the context of the North. What makes leadership asymmetric? It is that its authority is derived from enabling the enterprise’s responses to each client situation to be appropriately aligned in each case, one-by-one. Its authority is not derived from what is already-known by the enterprise – that already-known, vested in the leader, rendering his or her leadership symmetric aka North South dominant. An example of this is given in considering what makes practice-based commissioning difficult in practice. This notion of balance was based originally on The Book of Five Rings written by Shinmen Musashi in 1645 (Allison & Busby: London, 1974), and in particular its notion of the void: “By void I mean that which has no beginning and no end. Attaining this principle means not attaining the principle. The Way of strategy is the Way of nature. When you appreciate the power of nature, knowing the rhythm of any situation, you will be able to hit the enemy naturally and strike naturally”. For us, this “enemy” is that which prevents us from continuing to be dynamically responsive to the situation. What makes this balance so difficult is the very different nature of each of the four agendas. Thus on the one hand is the conveyance of a shared sense of what the enterprise is about (N), and the grounding of this in meeting the challenges of each client’s situation (E). But in order for HR policies and systems of accountability to support dynamic alignment (E), and in order for the enterprise’s resources and infrastructures to deliver requisite agility (S) a wholly different order of complexity and timescale have to be managed. 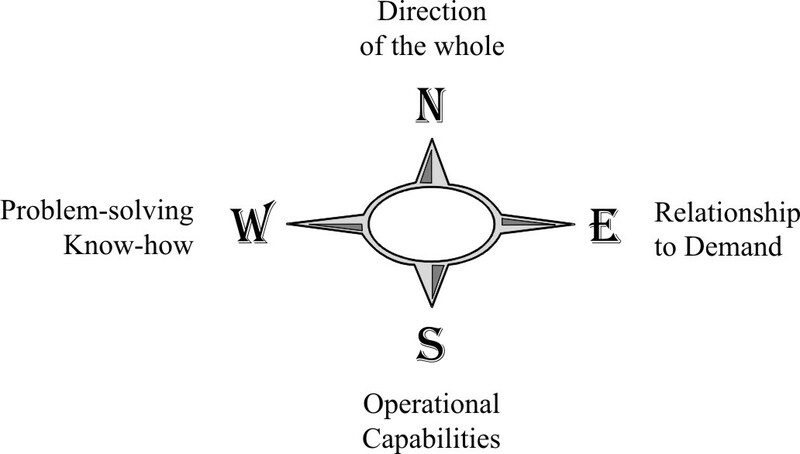 Failing to balance the ‘relationships’ (NE) with the ‘engineering’ (SW) means a split between a NE espoused theory and a SW theory-in-use with fatal consequences for the development of the enterprise as a whole. The nine varieties of ground provide a way of thinking about the different kinds of challenge leadership faces as the four agendas become unbalanced. Fire: “This book is about fighting. The spirit of fire is fierce, whether the fire be small or big; and so it is in battles. This is the steadiness of intent with which the client challenges are enabled to be met. Wind: “This book is not concerned with my Ichi school but with other schools of strategy. By Wind I mean old traditions, present-day traditions, and family traditions of strategy… it is difficult to know yourself if you do not know others. To all Ways there are side-tracks. If you study a Way daily, and your spirit diverges, you may think you are obeying a good Way but objectively it is not the true Way. If you are following the true Way and diverge a little, this later will become a large divergence.” This is the ability to recognise and respond to what is ‘other’ about the client situation that is expressing an unmet need. Ground: “It is difficult to realise the true Way just through sword-fencing. Know the smallest things and the biggest things, the shallowest things and the deepest things. As if it were a straight road mapped out on the ground…”. This is about knowing were you stand in all respects in being able to act effectively. Water: ‘With water as the basis, the spirit becomes like water. Water adopts the shape of its receptacle, it is sometimes a trickle and sometimes a wild sea. ” This is about neither the ‘organisation-in-the-mind’ nor the ‘world-in-the-mind’ being frozen, but being able to take up the shape of what is being faced.